12V 750mAh Fully automatic 3 Stage Lead Acid battery charger. Suitable for batteries - 1.8Ah - 42Ah Capacity. 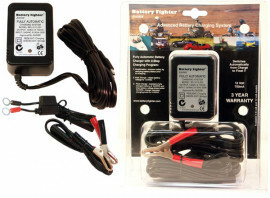 - Three Step Microprocessor Electronic Control: The Battery Fighter is an intelligent Four Step charger, able to closely monitor your SLA batteries health and state of charge. It maintains battery condition and charge in a much more controlled way. Your batteries will last longer because of this. 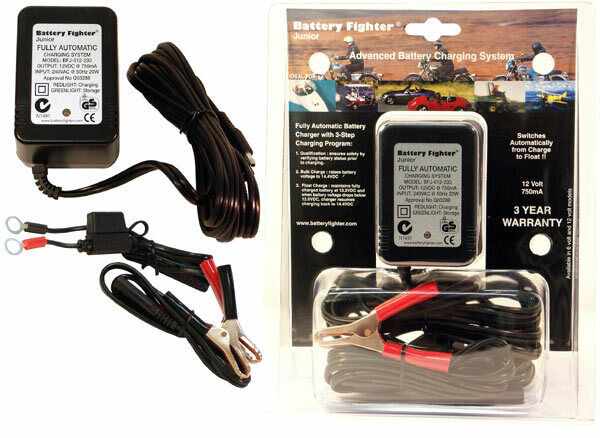 This is a big difference between the Battery Fighter and other one or two Step Sealed Lead Acid Chargers. - Spark Proof: Saftey Plus! Arcing and Sparking is the last thing you need when connecting and disconnecting chargers to SLA and flooded batteries. - Two Colour LED Charge Indicator: Know the state of your battery at any time. No guessing. - Full 3 Year Warranty! - Delivery is $10.00 Australia Wide!